2017 Year-End Tax Planning for Individuals - POKCPA - Palius + O'Kelley CPAs Inc.
As we get closer to the end of yet another year, it is time to tie up the loose ends and implement tax saving strategies. This has been an interesting year in Washington. When the year started, it seemed highly likely that the tax law would receive a dramatic makeover this year. Now, with just under two months left in 2017, we have seen a lot of bickering in Washington but no sweeping tax law changes. Of course, there is still time, but there is also a lot of ground left to cover. Despite the current uncertainties, keeping an eye on your taxable income is more important than ever. Absent any last-minute legislation, the top federal income tax rate for 2017 remains at 39.6%, but higher-income individuals can also be hit by the 0.9% additional Medicare tax on wages and self-employment income and the 3.8% Net Investment Income Tax (NIIT), which can both result in a higher-than-advertised marginal federal income tax rate. President Trump ran on a platform of consolidating and reducing individual tax rates. The Trump/GOP “framework for tax reform,” released in late September, would reduce the maximum corporate rate to 20 percent, eliminate the federal estate tax and the alternative minimum tax (AMT), as well as limit the maximum tax rate applied to the business income of small and family-owned businesses conducted as sole proprietorships, partnerships and S corporations to 25 percent. It will likely remain unclear until late November or early December whether tax reform will happen before the end of 2017, and if so, whether the law changes will be temporary or permanent and whether they will be prospective or retroactive. 1. Effective tax planning requires taking into consideration both this year and next year, at a minimum. Without a multi-year outlook, you cannot be sure maneuvers intended to save taxes on your 2017 return won’t backfire and cost additional money in the future. 2. Be on the alert for the Alternative Minimum Tax (AMT). Although there has been talk about repealing the AMT, it is still on the books and needs to be considered in all of your planning because what may be a great move for regular tax purposes may create or increase an AMT problem. There is a good chance you will be hit with AMT if you deduct a significant amount of state and local taxes, claim multiple dependents, exercised incentive stock options, or recognized a large capital gain this year. Outlined below are some planning ideas to consider while there is still time to act before the year is over. While some of the ideas may apply to you, some may apply to family members, and others may apply to your business. As of January 1, 2018, all household employers, regardless of how many employees they have, will be required to comply with the New Electronic Reporting and Payment Requirement mandated by the California Employment Development Department. You must electronically submit employment tax returns, wage reports and payroll tax deposits to the EDD. If you do not have an online account with the EDD, you may browse to http://www.edd.ca.gov/Payroll_Taxes/e-Services_for_Business.htm and enroll. We invite you to call us for referrals to payroll tax services that can handle domestic employees. Due to the time value of money, it’s better to pay taxes later rather than sooner (assuming your tax rates won’t be appreciably higher next year). Therefore, strategies that defer income from the current year to later years and those that move deductions from later years into the current year are always popular. 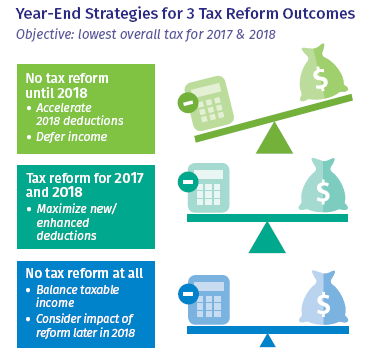 These time-honored strategies could be particularly effective this year if tax reform with lower tax rates is enacted, but doesn’t take effect until next year. Accelerate Itemized Deductions in 2017. If you currently take advantage of itemized deductions, you may want to accelerate next year’s deductions into this year. First, you will get the benefit of the additional tax deductions this year, and that is always good. Furthermore, if tax reform is enacted and effective next year, not only may your tax rate be lower next year, thereby reducing your tax savings from the deductions, but some of these deductions could be limited, eliminated, or rendered useless by an increased standard deduction. • Make charitable contributions you would normally make in early 2018 at the end of 2017. Note that donations charged to a credit card are deductible in the year charged, not when payment is made on the card. Thus, charging donations to your credit card before year-end enables you to increase your 2017 charitable donations deduction even if you are temporarily short on cash. • Make a gift to a donor-advised fund. These funds essentially allow you to obtain an immediate charitable contribution deduction for setting aside funds that will be used for future charitable donations. With these arrangements, which are available through a number of major mutual fund companies, as well as universities and community foundations, you contribute money or securities to an account established in your name. You then choose among investment options and, on your own timetable, recommend grants to charities of your choice. The minimum for establishing a donor-advised fund is often $10,000 or more. These funds can make sense if you want to obtain a tax deduction now but take your time in determining or making payments to the recipient charity or charities. They may also be a way to establish a family philanthropic legacy without incurring the administrative costs and headaches of establishing a private foundation. • If you are in business for yourself and a cash-method taxpayer, you can postpone taxable income by waiting until late in the year to send out some client invoices. That way, you won’t receive payment for them until early 2018. Of course, before deferring income, you must assess the risk of doing so. You might also consider prepaying a reasonable amount of deductible business expenses such as office supplies and repairs and maintenance before the end of this year. Setting up a retirement plan and/or making additional deductible retirement plan contributions for the year is another idea. • If you are a participant in a 401(k) plan and have not already maxed out your elective contributions to the plan this year, consider increasing contributions through the year-end. Depending on your employer’s plan, you may be able to contribute 100% of your compensation up to $18,000 ($24,000 if you are age 50 or older). • For sales of property, consider an installment sale that shifts part of the gain to later years when the installment payments are received. Additional ideas are presented throughout this letter. Depending on your taxable income, the 2017 federal income tax rates on long-term capital gains and qualified dividends are 0%, 15%, and 20%, with the maximum 20% rate affecting taxpayers with taxable income above $418,400 for single taxpayers, $470,700 for married joint-filing couples, and $444,550 for heads of households. High-income individuals can also be hit by the 3.8% NIIT, which can result in a marginal long-term capital gains/qualified dividend tax rate as high as 23.8%. Still, that is substantially lower than the top regular tax rate of 39.6% (43.4% if the NIIT applies). Sell the Right Shares. Generally, when you sell stock or mutual fund shares, the shares you purchased first are considered sold first, which is good news if you are trying to qualify for the long-term capital gain rate. But, there may be situations where you’re better off selling shares that have been held a year or less rather than those held longer. Selling recently purchased shares at little or no gain (because you purchased them at a higher price) may be better than selling shares held for more than one year if that sale would produce a significant gain. Whenever you want to sell shares other than those you purchased first, you must properly notify your broker as to the specific shares you want sold. Harvest Capital Losses. Biting the bullet and selling some loser securities (currently worth less than you paid for them) before year-end can be a tax-smart idea. The resulting capital losses will offset capital gains from other sales this year, including high-taxed short-term gains from securities owned for one year or less. For 2017, the maximum rate on short-term gains is 39.6%, and the 3.8% NIIT may apply too, which can result in an effective rate of up to 43.4%. However, you don’t need to worry about paying a high rate on short-term gains that can be sheltered with capital losses (you will pay 0% on gains that can be sheltered). If capital losses for this year exceed capital gains, you will have a net capital loss for 2017. You can use that net capital loss to shelter up to $3,000 of this year’s high-taxed ordinary income ($1,500 if you’re married and file separately). Any excess net capital loss is carried forward to next year. Selling enough loser securities to create a bigger net capital loss that exceeds what you can use this year might also make sense. You can carry forward the excess capital loss to 2018 and beyond and use it to shelter both short-term gains and long-term gains recognized in those years. Make Charitable Donations from Your IRA. IRA owners and beneficiaries who have reached age 701/2 are permitted to make cash donations totaling up to $100,000 per individual IRA owner per year—$200,000 per year maximum on a joint return if both spouses make QCDs of $100,000—to IRS-approved public charities directly out of their IRAs. These so-called Qualified Charitable Distributions, or QCDs, are federal-income-tax-free to you, but you get no itemized charitable write-off on your Form 1040. However, that is okay because the tax-free treatment of QCDs equates to an immediate 100% federal income tax deduction without having to worry about restrictions that can delay itemized charitable write-offs. It also reduces your AGI. QCDs have other tax advantages, too. Contact us if you want to hear about them. Be careful—to qualify for this special tax break, the funds must be transferred directly from your IRA to the charity. Take Your Required Retirement Distributions. Individuals with retirement accounts must generally take withdrawals based on the size of their account and their age every year after they reach age 701/2. Failure to take a required withdrawal can result in a penalty of 50% of the amount not withdrawn. There’s good news though—QCDs discussed above count as payouts for purposes of the required distribution rules. This means, you can donate all or part of your 2017 required distribution (up to the $100,000 per individual IRA owner limit on QCDs) and convert taxable required distributions into tax-free QCDs. Also, if you turned age 701/2 in 2017, you can delay your 2017 required distribution until April 1, 2018. However, waiting until 2018 will result in two distributions in 2018—the amount required for 2017 plus the amount required for 2018. While deferring income is normally a sound tax strategy, here it results in bunching income into 2018. Thus, think twice before delaying your 2017 distribution to 2018—bunching income into 2018 might throw you into a higher tax bracket or have a detrimental impact on your tax deductions. Adjust Your Federal Income Tax Withholding. If it looks like you are going to owe income taxes for 2017, consider bumping up the federal income taxes withheld from your paychecks now through the end of the year. When you file your return, you will have to pay any taxes due less the amount paid in and/or withheld. However, as long as your total tax payments (estimated payments plus withholdings) equal at least 90% of your 2017 liability or, if smaller, 100% of your 2016 liability (110% if your 2016 adjusted gross income exceeded $150,000; $75,000 for married individuals who filed separate returns), penalties will be minimized, if not eliminated. Make Sure You Have Adequate Health Insurance Coverage. If you and your family don’t have adequate medical coverage (referred to as minimum essential coverage), you may be subject to a penalty. Although there has been talk about repealing this penalty, it is still on the books and needs to be considered. Medical insurance provided by your employer, or through an individual plan purchased through a state insurance marketplace, generally qualifies as adequate coverage. The penalty amount varies based on the number of uninsured members of your household and your household income. If you have three or more uninsured household members, the penalty could be $2,085 or more for 2017. Take Advantage of Flexible Spending Accounts (FSAs). If your company has a healthcare and/or dependent care FSA, before year-end you must specify how much of your 2018 salary to convert into tax-free contributions to the plan. You can then take tax-free withdrawals next year to reimburse yourself for out-of-pocket medical and dental expenses and qualifying dependent care costs. Watch out, though, FSAs are “use-it-or-lose-it” accounts—you don’t want to set aside more than what you will likely have in qualifying expenses for the year. If you currently have a healthcare FSA, make sure you drain it by incurring eligible expenses before the deadline for this year. Otherwise, you’ll lose the remaining balance. It is not that hard to drum some things up: new glasses or contacts, dental work you’ve been putting off, or prescriptions that can be filled early. Consider a Health Savings Account (HSA). If you are enrolled in a high-deductible health plan and don’t have any other coverage, you may be eligible to make pre-tax or tax deductible contributions to an HSA of up to $6,750 for a family coverage or $3,400 for individual coverage—plus an extra $1,000 if you will be 55 or older by the end of 2017. Distributions from the HSA will be tax free as long as the funds are used to pay unreimbursed qualified medical expenses. Furthermore, there is no time limit on when you can use your contributions to cover expenses. Unlike a healthcare FSA, amounts remaining in the HSA at the end of the year can be carried over indefinitely. Currently, the unified federal gift and estate tax exemption for 2017 is $5.49 million, and the federal estate tax rate is 40%. While there has been talk of repealing the federal estate tax, we will believe it when we see it. In any case, your estate plan may need updating to reflect the current estate and gift tax rules, whatever they turn out to be. Also, you may need to make some changes for reasons that have nothing to do with taxes. Contact us if you think you could use an estate planning tune-up. Through careful planning, it is possible that your 2017 tax liability can still be significantly reduced, but do not delay. The longer you wait, the less likely it is that you will be able to achieve a meaningful reduction. The ideas discussed in this letter are a good way to get you started with year-end planning, but they’re no substitute for personalized professional assistance. Please don’t hesitate to call us with questions or for additional strategies on reducing your tax bill. We would be glad to set up a planning meeting or assist you in any other way that we can. Palius, O’Kelley & Janzen CPA’s, Inc.